The TB6560 CNC Stepper Motor Driver is suitable for processing various pattern modules, carving portrait, scenery, handwriting and sealing. And it's specially designed for stepper motors with rated current from 1.5A to 3.5A. Toshiba TB6560AHQ chip - High power, maximum 3.5A drive current chipset . 1-1/16 microstep setting - Higher accuracy and smoother operation than standard 1, 1/2 step. Overload, over-current and over-temperature safety - Full protection for your computer and peripheral equipment . On board current switching - Power output can be set according to specific user requirement . 4 channel inputs interface- Can be used for XYZ limit and emergency stop . Professional design - Two stage signal processing with super anti-jamming . Bipolar constant current chopper drive with non-resonant region - Controls motors smoothly through range without creep effect . Four control inputs (divided into pairs of knives) - Allows setting of limit and emergency stop . Universal architecture - Supports most parallel software MACH3,KCAM4 etc. 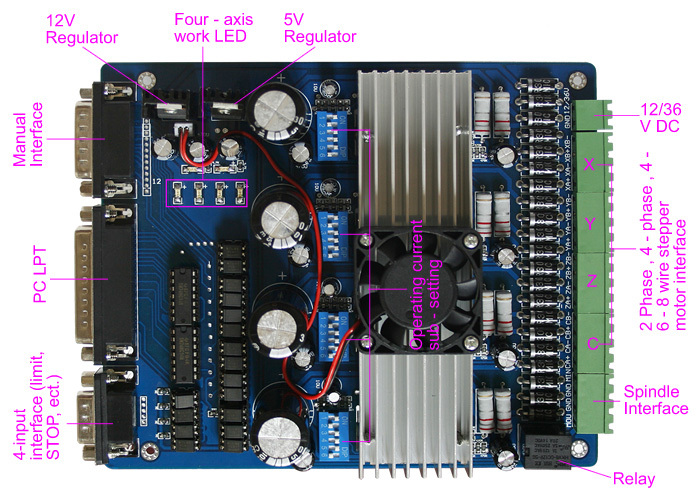 This driver is the 1.5A-3A version, it's specially designed for stepper motors with rated current from 1.5A to 3.5A, it's NOT compatible with stepper motors with rated current below 1.5A or above 3.5A.